The first few minutes of "Lincoln", taken from Tony Kushner’s screenplay based on the book "Team of Rivals" by Doris Kearnes Goodwin, is deft and masterful. At first you worry Steven Spielberg has ripped a page from his own manual by kicking events off with a brutal battle re-enactment, only to move it aside quickly for two black Union soldiers reciting their accomplishments to an unseen face. The shot reverses. The unseen face is President Abraham Lincoln (Daniel Day Lewis). It tells us that Lincoln is specifically about what he is trying to gain for them. Two white soldiers approach. They futz around, reciting The Gettysburg Address. One of the black soldiers recites a few of its words too. The words, the movie is saying, have resonated, but now they must be backed up as more than mere rhetoric. The film takes place in the waning days of the grisly War Between The States. The army of Ulysses S. Grant (Jared Harris) is advancing on the Confederacy at Wilmington, threatening to force either a peace negotiation or surrender. Jefferson Davis sends three advisors, including his Vice President, northward in hopes of brokering a treaty. President Lincoln, however, has loftier ideals. He yearns to push the 13th Amendment, abolishing slavery, through the squabbling House of Representatives, and he requires the pretense of war to make it appear as if slavery’s abolishment is the only way to effectuate the war’s end. 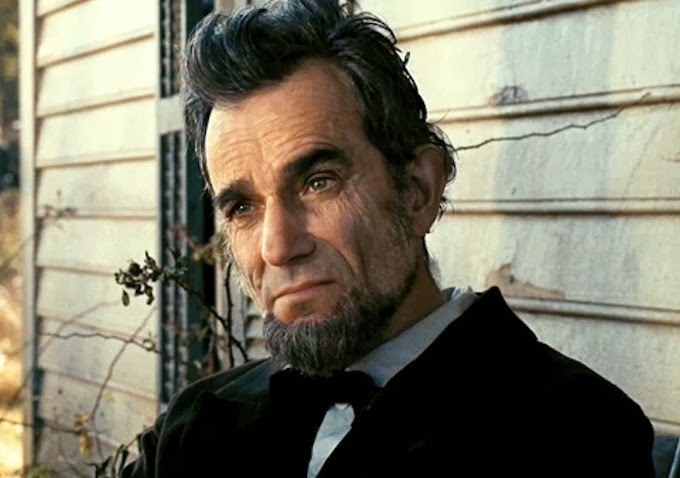 "Lincoln", directed in a basic but elegant fashion by Spielberg, forgoes the trappings of the modern biopic by essentially not being a biopic – a re-telling of a whole life – but a chronicling of a key event in that life. By doing so, the essence of the man reveals itself through his decisions, interactions, and the way he goes about attaining equality. To do so he must abstain from playing fair, and willingly employs three skilled connivers (James Spader, John Hawkes, Tim Blake Nelson) to cajole opposing Democrats of the Congress to turn coat and vote for the Amendment. One of the film’s most telling sequences involves a dozen or more African Americans entering the U.S. Capitol Chamber as the people rise and the John Williams’ score dramatically swells, only to have Spader’s character an instant later lift his finger in impersonation of a gun at one of the representatives down below whose vote they demand. It’s a wonderful moment in which Spielberg – intentionally or not – undercuts his own typical pomp, which is sort of the movie as a whole is doing. 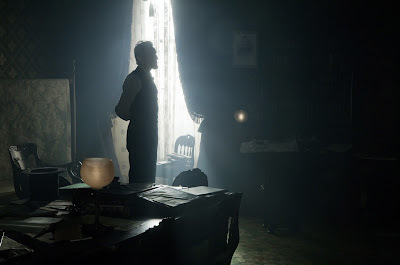 So too is Lincoln’s personal life mixed in with the political intrigue, the madness of his wife Mary Todd (Sally Field), her worries over how the nation will view the man they love if he pushes for something so controversial, and the anger of his son Robert (Joseph Gordon-Levitt) who wishes only to join the Union army to prove his self-worth. Rather than feel forced, however, these passages demonstrate the full and tiring nature of the President’s existence, and the way his position calls for nearly eternal conflict. “Lincoln’s” coda is the only troublesome spot. The presenting of his death, brief as it may be, is the one moment when History Channel-ness creeps into the production, an obligatory recitation of facts as opposed to re-illustrating the film’s themes. I did, on other hand, appreciate the (inevitable) placement of the snippet of the infamous Gettysburg oration. It brings it full circle from the opening, showing that the rhetoric did become reality. And it is not even the most crucial speech in the film. No, the film’s most crucial speech is less a speech than one of the President’s many folksy parables, told to two nameless men in a telegraph room. Throughout "Lincoln", Honest Abe is sneaky and calculating in obtaining what he desires. His ideology, though, whether he was reciting it for 15,000 people or 2 people, was never in doubt.